Deep Dreamer is the easiest way to process images and video with Google’s amazing Deepdream engine. Give it a photo, and watch as horizons get filled with towers and pagodas. Rocks and trees turn into buildings. Birds, dogs, and insects (AKA puppyslugs) start to appear from out of nowhere. 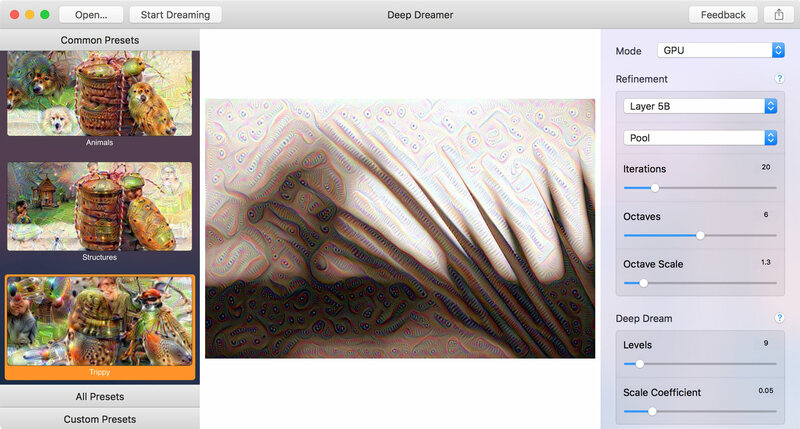 Deep Dreamer takes your deep dreams to the next level with animated creations. Take a clip from your favourite movie, or any QuickTime movie file, and process it to reveal the shapes and objects hiding within it. Process a still photo and as Deep Dreamer interprets your image it’ll generate an animated GIF of the process. Create stunningly beautiful images or terrifying nightmare visions – the choice is yours!